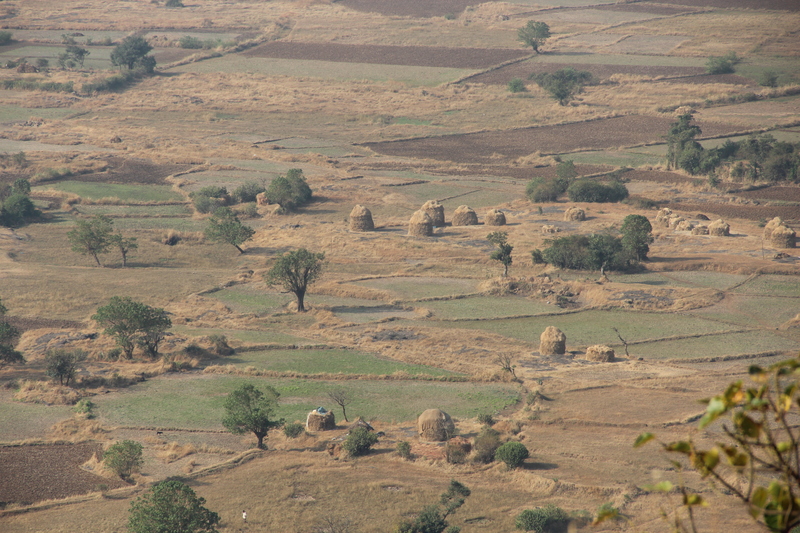 View from the hill top on the way to the caves. My dear revered readers, the last three posts were the preface of the new segment called ‘Our lost rich heritage. Swami Nityananda caves, Kanhangad, Kerala’ and were the introductory and basic posts to start with. This segment is not purely dedicated to our lost rich heritage or heritage sites or environment for that matter. The posts are about seeing our past rich heritage in a new mirror with a new sight-with that of spiritual eyes called the divine eyes. And nevertheless we shall pick up environmental issues also and then interweave all these issues and thoughts in one post as there is a co-relation amongst all these subjects because they concern us and our lives. Ekvira temple adjacent to Karla caves about 60 kms from Mumbai. As per the wishes of His Holiness Shri Mahavatar Babaji, in the forth coming posts which will involve a lot of travelling for me, I will cover many world heritage sites of India with a new light and perspective which has been undertaken by none before. It is only with the gifted spiritual eyes and divine wisdom that he again and again bestows on me because of which I can go back in time effortlessly and get to know how richly our human race was endowed even at that time in realms of development- physical and spiritual both. So many mindboggling and surprising revelations as grace have come over me in my meditations because of only him. 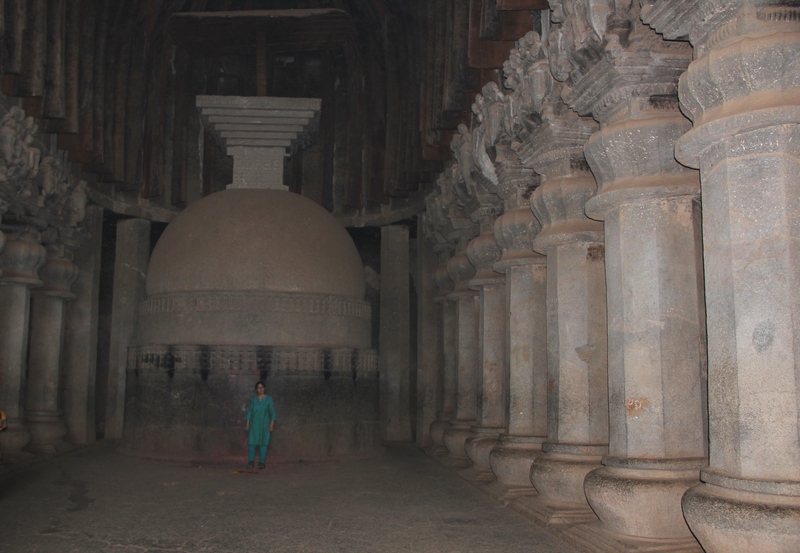 To give you an example I found out that the Karla caves near Mumbai, which are of Buddhist genre were carved out at the site of Ekvira Temple. 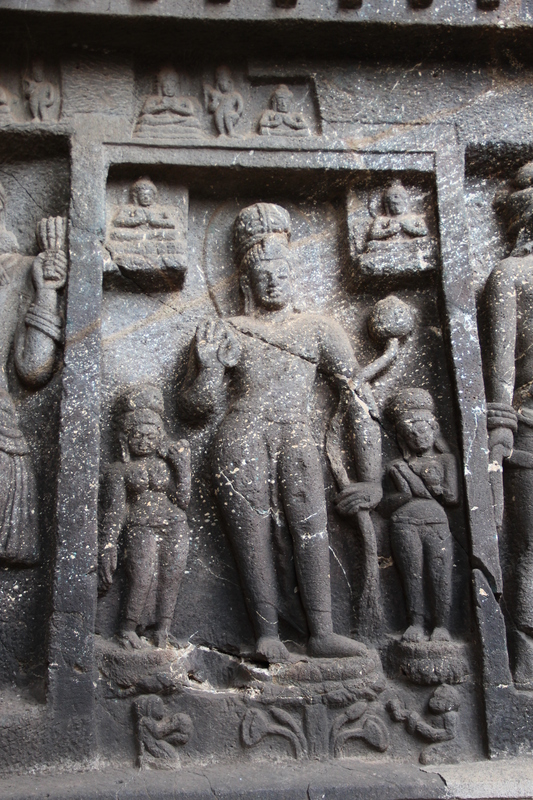 This devi temple was constructed by the Pandavas in exile about five thousand years ago. 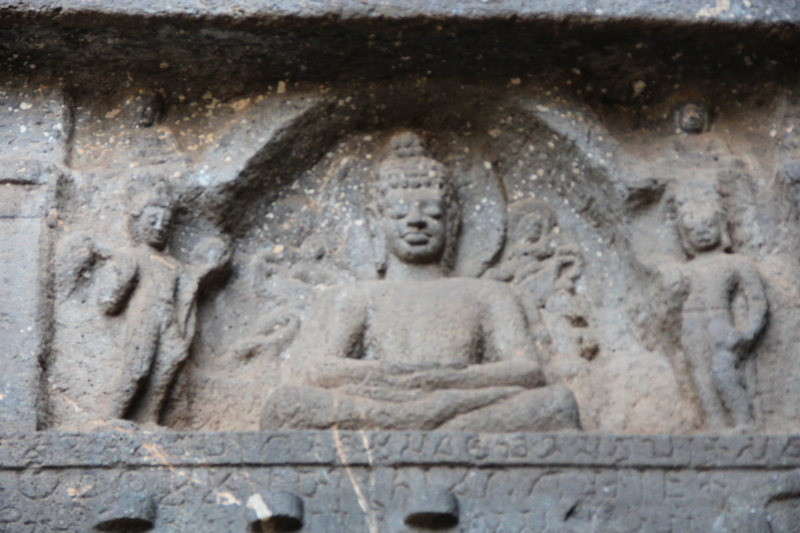 Hence the caves which have come up later around two to two and a half thousand years ago have been constructed just next door to this temple in order to derive the shakti or power for enhancing the spiritual practices of the bhikshus or the monks. It was after Mahavatar Babaji told me to mediate on Om I saw a miracle. Since then I have been hearing the sacred sound of Om in my ears when I have doing my regular work of the day in spite of nonstop irritating, ear-piercing honking of vehicles on the streets and roads, sharp sounds of drilling and tile cutting machines all around my house and banging and clatter of vessels and deafening gurgling of water from the taps in the kitchen when the domestic helper is at her daily job. The sound of Om was so audible and prominent that it became impossible for me to bear the aforesaid noises any more as it was hurting my head and I could bear it no longer. So with the same sacred sound of Om still reverberating in my ears, when I went to sleep on 7th Dec night I had put my finger tips tightly in the ears to refuse entry to those agonizing sounds of snarling traffic in order to prolong this mystical sound and manage to get hold of some extensive peaceful moments. Once this was achieved, I only heard nonstop Om first in my head and then in my whole body. There was not a speck or decibel of any sound inside me apart from Om and the continuity of this mystical sound was awesome and the phenomenon breathtaking. Nothing compares this experience to any experience of the world that we live in and I made sure that my mind is anchored firmly at one centre to be able to lengthen this magical experience. And just as I was able to get enough of it, I entered shunya , the silence. Ah! At last the silence of my soul was touched. It was a thoughtless state where nothing happened, no sound and no thought-pure Brahma, the purest Brahma. It was as if at last I was able to lay a hand on the last level of the infinite ocean. All along very gently I was reaffirming to myself that I am this, I am Om; this is what I am truly, this is my real identity. Babaji again showed me the creation of Universe and presence of Brahma and the similarity of the two experiences- one now and here and the other at the point of eternity. I envisioned after this a complete movie like vision in my inner eyes of our planet rotating continuously tilting at its axis after which the planet vanished and I saw nothing. This state of nothingness endured for a short while as I travelled back in eternity to fathom the state of affairs even before the Universe was created. Once I reached at that time, I experienced in me that there was only silence that existed before the planets were created and it is the same silence or shunya that I have just experienced now at this moment after I heard Om in my body. This goes to prove that the same Om which existed as the first sound in this Universe and the shunya or silence that existed before Om are the same two things which still exist in this Universe and they are the same two things that are present in me too. In other words pure Brahma is in me and the sacred sound Om is present in me even now. It is the same thing and I just rediscovered them during those most auspicious moments of my life!!! Never before could I get so close to it!! Thanks to my great, great Guru Shri Mahavatar Babaji who is the most generous soul in this whole Universe who granted me such momentous time in the last few days in spite of the nervewracking, inharmonious sounds and crazy speed of my life!! Thanking enough will not do, I must repay this kindest gesture by doing more manav seva– serving humanity for sure. Pujya Babaji has told me that there was only nishabdi brahma and silence before the earth was formed billions of years ago. Once the earth was created and formed, the first sound that was born and emanated was that of Om. The same sound still reverberates and is heard in the silence of nature, forests, oceans and seas even now. And in the next flash of a moment I recalled that as a child when we went for summer holidays, the same sound of Om was heard in my ears at night in nearby forests in Rishikesh, Dehradoon or while going to Himalayas in childhood. (To understand this interweaving and complex concept of our environment, Spirit and our thoughts read on three interrelated posts Thought Power I, II & III where in sankalpa or thought is elaborated in quite a detail. The soul of the disciple surrenders to the Spirit of the Divine Teacher. Out of sheer love, the Teacher blesses the obedient disciple. The blessing in turn enhances the growth of the disciple by initializing the purification of the mind and body. The disciple in due course of time surrenders more and the Spiritual Teacher endows more grace, kindness and blessings on the loving disciple. This goes on for a few years until the disciple is completely washed of all his sins and shortcomings and the soul of the disciple mingles wholly with the pure, blazing Spirit of the Divine Teacher and they become one in Spirit. This whole process is a wonderful experience for both- the disciple as well as the guardian Teacher because the growth and progress of the disciple is entirely dependent on the will of the disciple. The more the disciple wants to grow, the more the Teacher helps him/her to grow large in Spirit. A tribute -This post is my tribute to our Mother Nature and it emphasizes the importance of regaining and re-growing our lost forests because apart from the million benefits that they offer, there is one more great reason for us to contribute towards afforestation. The more green cover we have on our planet, the more sacred Om sound shall prevail on it! Om shanti, shanti, shanti Om! This entry was posted on Saturday, December 10th, 2011 at 9:58 pm and is filed under Uncategorized. You can follow any responses to this entry through the RSS 2.0 feed. You can leave a response, or trackback from your own site. This was the main aim of the post-to spread peace and knowledge. Hi Sarika, Both Aditya and I read this post. It is just amazing and reminded us of the teachings you gave us the other day on “Om”. We both feel inspired to meditate on Om now. I have visited the Ekvira temple earlier but did not know its significance until I read your post now. Thanks for guiding us always and getting us closer to Mahaavtaar Babaji. Dear Kanchana, it fills my heart with so much joy that you and your son Aditya are together reading the blog with so much interest. May God bless your endeavours on this spiritual path. There is nothing in this world that will give you more happiness than what you will get in meditation. Now to meditate daily is like bringing the horse to drink water! You must take out some time daily as there cannot be 25 hrs for us!! To add meditation in your life, sort out your life. Leave out not so useful activities and in this way create time and energy for yourself. Calm yourself, blow away unwanted agitation and catch hold of your unruly mind. By forcefully taming the mind, it will be silenced with regular sadhana. Generate peaceful vibes in your house. Once meditation is incorporated in normal life, you will begin to progress. Please let me know if I can be of some assistance to you. My sincere wishes are with you now and always. I have been following all your posts & keeping them in my system. Your posts have always been fantastic, thought provoking & peaceful (i couldn’t find the more proper words), especially this one on Om meditation. I am a devotee of Sai baba & Avadhoot Baba Shivanand ji. By my guru’s grace, I would like to remove my sanchit karmas & grow spiritually. Thanks again for these beautiful articles. By God’s kind mercy and grace, the wisdom filled words born at sacred hours are doing its magic- spreading peaceful vibrations on our planet, some people are receptive and they in turn will also spread peace and tranquility….sushmaji, if you have soaked yourself in the divine vibrations then please spread love and peace all around you. You are absolutely right. The power of words end somewhere and we have to make do with those same words again and again. Peace is a small word while the experience of divine peace is altogether different. Needs to be experienced; words fall off, only the experience lingers…. On the contrary this post was not too tough to comprehend as most of the facts mentioned in this were known to me since the days in Mother’s International where I had read in one of the books about the origin and sound of Universe. Also I have an uncle in Kolkata who is a devoted disciple of Ramkrishna Paramhansa and he had mentioned to me that Om is the sound of the Universe and the more we utter Om with full energy of our inner being the more we cleanse our systems. How much time everyday you devote to practise meditation to reconnect with your Teacher? Is it necessary to utter the word “Om’ loudly to attain the peace within or can we utter it silently in our minds? There have been times of extreme commotion and turmoil in my mind and I usually utter few of the old devotional songs from school days to ward off any thoughts detrimental to creative thinking. 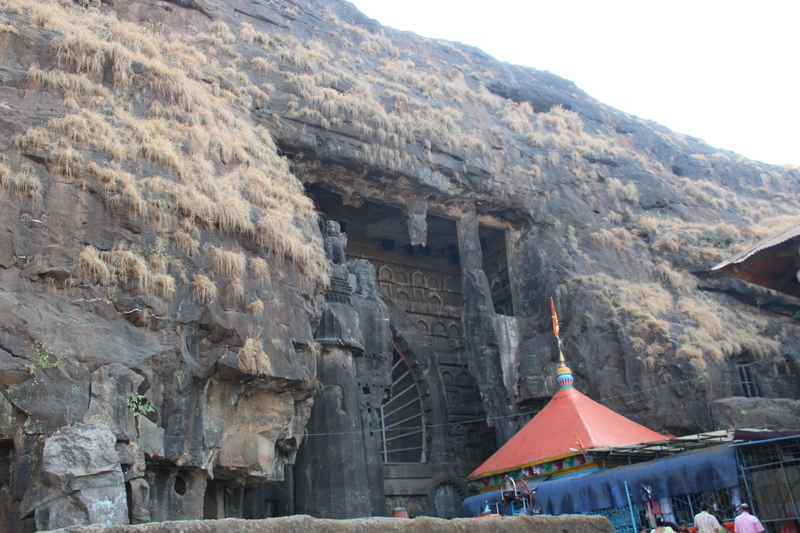 If you have visited Karla caves, I will also suggest you to visit the Bhaja caves which is near to Lohagad and Visapur forts. The nearest railway station is Malvali station on the Karjat – Pune line or take Malvali Exit from the Pune Expressway to reach there. Go on some weekday if possible because weekends are very crowded due to huge numbers thronging to do a trek to Lohagad-Visapur. Thanks for the peace which this post bestowed on me this morning. Please erase this ego.An unnecessary burden it is.Let me have your taste.Sweet it is.Thoroughly incapable am i.Only yours grace will dissolve it fully.Let the separation be evaporated like dew drops in the sun..
How wonderful this inner experience must have been. Hope we all get to experience this someday. pranam to sri sri mahavatar babaji, and ma. thanks for this sacred post. the experience of hearing aum is just great. I am sure nothing can give that much peace itself inside when hearing that sacred sound.trance in all time. i tried to simply imagine it. but i know its not that simple to get it. Thanks a lot for this post ma as always. wish whoever visit this blog and read may blessed by the great sage sri babaji and all other great saints. Amatraha = without syllable; avyavaharyaha = is not transactable; prapanjopasamaha =control of the cosmos; Sivaha= pure; advaitaha = without two; caturthaha (padaha) = fourth (quarter). Evam = thus; omgaraha = Aum; atma eva = Atman itself; yaha = one who; evam = thus; veda= knows; (saha = he) Atmana = with Atman; Atmanam samvisati= enters Atman. That which has no syllable and is not transactable which is the control of the cosmos, is pure, is without two, is the fourth quarter. Thus Aum is Atman itself. One who knows thus, enters Atman by Atman. Dearest Maa, I felt so much joy after reading this post. I can imagine pretty much how wonderful you would have felt after reaching the depth of the ocean by experiencing Shunya. And thank you for sharing the special paragraph on how and when can a seeker could have similar divine experiences. While reading the post, I was thinking of this question and was surprised to get your answer in the later para. Divine Joy and Peace to All! Respects and Gratitude God and All Divine Gurus for enriching our lives with this blog. Dearest Mom, Feel very happy to read this post again. But it is painful sometimes to know that Brahma, Om all are within me but due to some karmas or other obstructions, this divine world within me is hidden from me. I desire to awaken to the presence of Om and God in me. Pls guide me to do whatever is needed mom to reconnect to the divine with me. Without God life is 0. Dear Shahid, Nazma and others. Will reply soon to all of you on the blog, please wait. In the meantime please know that I have written two very good posts for FB day before. Waiting to get some leisure time to make it final. Maybe some of your questions and wishes will be answered through them. Love and my regards to all of my readers.